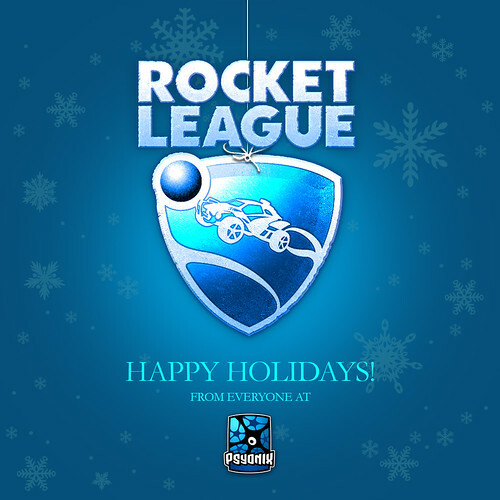 We couldn’t be more grateful for the amazing year we’ve had here at Psyonix Studios. With your help, your enthusiasm, and your unbelievable loyalty, Rocket League has created a family of almost nine million players worldwide and the numbers keep getting better each and every day! Next year, we have even bigger things in store for Rocket League, with a number of exciting announcements already planned to appear over the next several months. As always, we will continue to support the game as aggressively as we can, with new content, new modes, new DLC, new Arenas, and plenty of other cool things to keep you coming back and happy in 2016. Of course, nothing we accomplished this year (or plan to do for the next) would have been possible without you, our dedicated community. You helped us reach our dreams with Rocket League, and now we hope to inspire yours for many years to come. Merry Christmas, Happy Holidays, and thank you very much! Love this game so much fun and endless amounts of gameplay. Every time I start this game up I’m playing for hours thanks for a great game. Merry Christmas, Happy Holidays, and you are welcome! Rocket League is an amazing game and you guys are great developers that listen to the community that plays your game. I am glad it took off the way it did. I look forward to playing throughout the new year and can’t wait for all the stuff you guys will add to the game. It’s a Festivus for the rest of us! Snow Day Hockey is a ton of fun. Love how it plays. I’d love to see it back before next Christmas. However, the major flaw of that mode is the goal detection. It needs to be similar to the ball where the entire puck must cross the line to count. Make that change and I’m yours forever. Merry Christmas for you guys too! Absolutely love the game! Definitely my 2015 GOTY winner. Looking forward to more updates and even to Rocket League 2 in the future. I wish there was a way to team up with other people and play a league of 10 games in a row. Like a soccer world cup. The problem is really that people would disconnect. After getting this for free from PS Plus I’ve bought every single pack of DLC you guys offer. Keep the content coming and I’ll continue to support you. Voting with my wallet is my way of saying thank you. Thank you for the great game! I have to say I’m not much on sports games or racing games and I generally can’t stand anything competitive online but Rocket League is one of the best games I’ve played this year. Fantastic job, and I look forward to more incredible updates in the new year. You guys had my vote for game of the year and studio of the year. That random map select needs work. I can’t believe how much enjoyment I’ve gotten out of Rocket League. I actually feel guilty for getting it for free which is why I’ve bought every DLC day 1 and purchased download codes from two friends as Christmas gifts from Amazon! Keep up the great work folks! Absolutely enjoy the game guys. And Snow Day is fabulous I love spending half of the match running up and down the walls it changes the whole dynamic of the game. Please don’t let it disappear keep it in the mutators and please add it so I can host my own hockey matches. I’m slowly creeping my way into the Silver Rankings and having a blast doing it with my buddies in our own 3 person team. My only regret is that with the increased popularity the juvenile trash talk has sky rocketed. Merry Christmas Guys and Congrats on Your Well Earned Success. This is like the ultimate party game. Will definitely be spending some time listen to the amazing soundtrack and scoring some goals. Happy Holidays. I have the Platinum trophie for this game, it was pretty much one of the games that I enjoyed the most this year. Thank you Psyonix and happy holidays. Rocket League has provided the most fun ever for this years multiplayer. A casual Rocket session can turn into a high octane competitive obsession. Thank you Psyonix. Please add lot’s more Arenas. And please make the Arenas random each time. I hate playing them in the same order and never get to see certain Arenas. The least Arena I’ve played on is the new Wasteland Arena and when I did play on that one several time’s I found that’s my least favorite Map. Keep the field flat please. Can get a season pass? All of the paid DLC so far is cosmetic. It’s only cars, decals, toppers, antennas, wheels, and boost trails. They wouldn’t be doing a season pass for this type of content but I can see a bundle coming at some point. Merry Christmas to the team who created my surprise hit game of the year! Thanks for your work and looking forward to more in the New Year! Thanks for releasing this on Ps Plus, I feel compelled to buy all the dlc because of how fantastic this product is. Hey congratulations for the success of the game…unfortunately I’m not one of those 9 million “yet” but you guys sure deserve the success.I love the support you guys give to the game and its a shame I won’t be able to participate in the Christmas festivities for the game. Merry Christmas to y’all at Psyonix and good job. Always loved this game been playing since rocket powered battle cars on ps3, Would like to see some of those arenas on this game like the soccer field, pirate ship, etc. Also changing the ball up would be nice like on the pirate ship level from ps3 version. Thanks again for the new version on ps4!! Thanks Psyonix! Me and my little nephew have been having a blast with Rocket League (as well as SARPBC back in the day). All I ask for as a present would be to add the ice surface and puck to the mutators for offline play. Me and my nephew love to mess around in splitscreen without the stress of real people to worry about (though it is still fun, we’d just like the option). Thanks again and have a good holiday! Thank Psyonix, you turned my PS4 into a dedicated Rocket League only console! I just can’t get enough of the game, bought every DLC and will buy any that will come out in the future. You guys are top notch! Please PLEASE keep Snow Day as a permanent gameplay mode. I love it too much for it to just be seasonal! happy holidays to you all and good luck in 2016. Absolutely love the game, keep making DLC for this great title. Have bought everyone so far and will continue to, to support you all for future products. Again congrats and good luck with going to Xbox in 2016. You had me at “$10 Season Pass”. I want all that DLC. PLZ MAKE THE HOCKEY VERISON A PERMANANT FEATURE!!!!!!!!! It’s a great change of pace from the norm! Please do a poll to help keep this feature around! THANK U!!! !